Data encryption is mandatory for many government, financial, and regulatory entities, worldwide, to meet privacy and other security requirements. For example, the card payment industry has adopted the Payment Card Industry Data Security Standard (PCI DSS) for information security. Other examples include requirements imposed by United States government's Federal Information Security Management Act (FISMA) and Health Insurance Portability and Accountability Act (HIPAA). Encrypting data stored in HDFS can help your organization comply with such regulations. Introduced in CDH 5.3, transparent encryption for HDFS implements transparent, end-to-end encryption of data read from and written to HDFS blocks across your cluster. Transparent means that end-users are unaware of the encryption/decryption processes, and end-to-end means that data is encrypted at-rest and in-transit (see the Cloudera Engineering Blog post for complete details). Note: HDFS Transparent Encryption is not the same as TLS encryption. Clusters configured TLS/SSL encrypt network communications throughout the cluster. Depending on the type of services your cluster supports, you may want to configure both HDFS Transparent Encryption and TLS/SSL for the cluster. See Configuring Encryption for more information. Only HDFS clients can encrypt or decrypt data. Key management is external to HDFS. HDFS cannot access unencrypted data or encryption keys. Administration of HDFS and administration of keys are separate duties encompassed by distinct user roles (HDFS administrator, Key Administrator), thus ensuring that no single user has unrestricted access to both data and keys. The operating system and HDFS interact using encrypted HDFS data only, mitigating threats at the OS- and file-system-level. HDFS uses the Advanced Encryption Standard-Counter mode (AES-CTR) encryption algorithm. AES-CTR supports a 128-bit encryption key (default), or can support a 256-bit encryption key when Java Cryptography Extension (JCE) unlimited strength JCE is installed. HDFS encryption has been designed to take advantage of the AES-NI instruction set, a hardware-based encryption acceleration technique, so your cluster performance should not adversely affected by configuring encryption. (The AES-NI instruction set can be an order of magnitude faster than software implementations of AES.) However, you may need to update cryptography libraries on your HDFS and MapReduce client hosts to use the acceleration mechanism. See Optimizing Performance for HDFS Transparent Encryption for details. Integrating HDFS with an external, enterprise-level keystore is the first step to deploying transparent encryption. This is because separation of duties between a key administrator and an HDFS administrator is a very important aspect of this feature. However, most keystores are not designed for the encrypt/decrypt request rates seen by Hadoop workloads. This led to the development of a new service, called the Hadoop Key Management Server (KMS), which serves as a proxy between HDFS clients and the backing keystore. Both the keystore and Hadoop KMS must use Hadoop’s KeyProvider API to interact with each other and with HDFS clients. Cloudera Navigator Key Trustee Server is a key store for managing encryption keys. To integrate with the Navigator Key Trustee Server, Cloudera provides a custom KMS service, Key Trustee KMS. Hardware security modules (HSM) are third-party appliances that provide the highest level of security for keys. To integrate with a list of supported HSMs, Cloudera provides a custom KMS service, Navigator HSM KMS (see Installing Navigator HSM KMS Backed by Thales HSM and Installing Navigator HSM KMS Backed by Luna HSM). 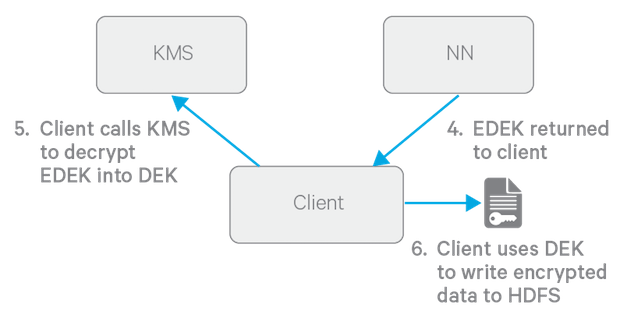 The diagram below illustrates how HDFS clients and the NameNode interact with an enterprise keystore through the Hadoop Key Management Server. The keystore can be either the Cloudera Navigator Key Trustee Server or a support HSM. To get started with deploying the KMS and a keystore, see Enabling HDFS Encryption Using the Wizard. For information on configuring and securing the KMS, see Configuring the Key Management Server (KMS) and Securing the Key Management Server (KMS). This section describes the various KMS solutions available, and identifies criteria often used for selecting each. HDFS transparent encryption introduces the concept of an encryption zone (EZ), which is a directory in HDFS whose contents will be automatically encrypted on write and decrypted on read. Encryption zones always start off as empty directories, and tools such as distcp with the -skipcrccheck -update flags can be used to add data to a zone. (These flags are required because encryption zones are being used.) Every file and subdirectory copied to an encryption zone will be encrypted. Note: An encryption zone cannot be created on top of an existing directory. Each encryption zone is associated with a key (EZ Key) specified by the key administrator when the zone is created. EZ keys are stored on a backing keystore external to HDFS. Each file within an encryption zone has its own encryption key, called the Data Encryption Key (DEK). These DEKs are encrypted with their respective encryption zone's EZ key, to form an Encrypted Data Encryption Key (EDEK). 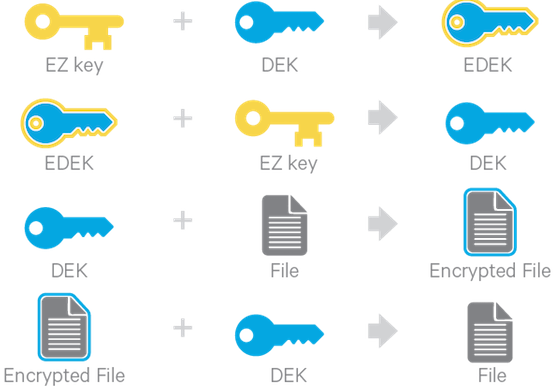 The following diagram illustrates how encryption zone keys (EZ keys), data encryption keys (DEKs), and encrypted data encryption keys (EDEKs) are used to encrypt and decrypt files. 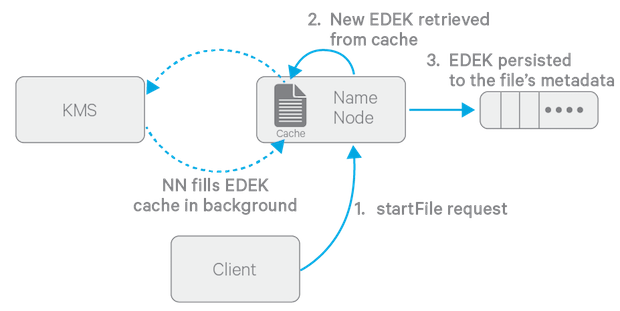 EDEKs are stored persistently on the NameNode as part of each file's metadata, using HDFS extended attributes (implemented as of Cloudera CDH 5.2). EDEKs can be safely stored and handled by the NameNode because the hdfs user does not have access to the EDEK's encryption keys (EZ keys). Even if HDFS is compromised (for example, by gaining unauthorized access to a superuser account), a malicious user only gains access to the encrypted text and EDEKs. EZ keys are controlled by a separate set of permissions on the KMS and the keystore. An EZ key can have multiple key versions, where each key version has its own distinct key material (that is, the portion of the key used during encryption and decryption). Key rotation is achieved by bumping up the version for an EZ key. Per-file key rotation is then achieved by re-encrypting the file's DEK with the new version of the EZ key to create new EDEKs. HDFS clients can identify an encryption key either by its key name, which returns the latest version of the key, or by a specific key version. For more information on creating and managing encryption zones, see Managing Encryption Keys and Zones. To encrypt a new file, the HDFS client requests a new EDEK from the NameNode. The NameNode then asks the KMS to decrypt it with the encryption zone's EZ key. This decryption results in a DEK, which is used to encrypt the file. The diagram above depicts the process of writing a new encrypted file. Note that the EDEK cache on the NameNode is populated in the background. Since it is the responsibility of KMS to create EDEKs, using a cache avoids having to call the KMS for each create request. The client can request new EDEKs directly from the NameNode. To decrypt a file, the HDFS client provides the NameNode with the file's EDEK and the version number of the EZ key that was used to generate the EDEK. The NameNode requests the KMS to decrypt the file’s EDEK with the encryption zone's EZ key, which involves checking that the requesting client has permission to access that particular version of the EZ key. Assuming decryption of the EDEK is successful, the client then uses this DEK to decrypt the file. Encryption and decryption of EDEKs takes place entirely on the KMS. More importantly, the client requesting creation or decryption of an EDEK never handles the EZ key. Only the KMS can use EZ keys to create and decrypt EDEKs as requested. It is important to note that the KMS does not store any keys, other than temporarily in its cache. It is up to the enterprise keystore to be the authoritative storage for keys, and to ensure that keys are never lost, as a lost key is equivalent to introducing a security hole. For production use, Cloudera recommends you deploy two or more redundant enterprise key stores.